» Is Ginger Good For Sore Throat? A sore throat is a feeling of irritation, dryness in the throat. It is a very common ailment of autumn and winter and usually gets away itself within a week. Any medicine or treatment is usually not required, but to ease the symptoms many home remedies and medicines are used. But, if the symptoms persist longer than a week, immediately talk with your physician and let him find out what’s good for your sore throat. The causes of a sore throat may include a viral infection, virus or bacteria. Does ginger treat a sore throat? Ginger is a proven natural remedy and has been in use for varieties of ailments for centuries. It gets its medicinal properties from the rich phytochemistry it has. It has been found to be a potent reliever in multiple digestive disorders, hypertension, diabetes mellitus, as well as in cancer. The anti-inflammatory and antimicrobial properties of ginger help to fight with the multitude of infectious diseases. The anti-inflammatory properties of ginger help in reducing symptoms of a sore throat. 1. Ginger and honey tea. Making ginger tea is one of the easiest ways you can do to use ginger for easing your sore throat. What you need to do is just cut two or three slices of raw ginger, and boil them with water for a minute. Once the temperature of the water drops to normal, remove the slices. You can add a few drops of honey to get a pleasing taste. Honey has also multiple good things to speed up your healing process. You can also add a teaspoon of lemon juice if you don’t hate the sour taste. Even gargling with warm water is found effective for a cough and cold. And if you add one or two teaspoons of ginger powder, it becomes even more effective in pleasing your throat. Try gargling twice a day with 300 ml warm water and 2 teaspoons of ginger powder. You may have a different set of ideas using ginger and pineapple together for your sore throat. Here is the easiest way to get that work for you. This is for 200-300 ml of ginger and pineapple juice. Get the pineapple slices processed in a juicer. Add boiled water in the pineapple juice and mix it properly. Once it is mixed, add 2 teaspoons of ginger powder and shake the mixture. Your ginger and pineapple juice is ready to serve. The pineapple derives its therapeutic properties from an enzyme called Bromelain. There are tons of ways you can use ginger in your diet. 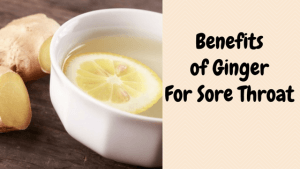 You can go a step ahead and develop your own recipes to get the full medicinal benefits of ginger and ease your sore throat. However ginger is a natural remedy for your sore throat, your healthcare professional is the single most reliable person in-case you need any medical attention. It is advised to discuss with your physician before applying any of the above-described remedies. Previous Post 5 Perfect Movies to Help With Depression (They Keep You COOL And Motivated) Next Post How Much Does Acupuncture Cost?